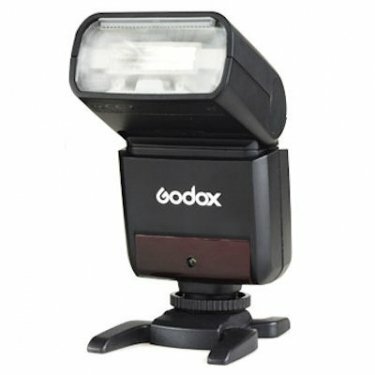 This Godox flash unit is amazing. It is able to last surprisingly long despite using only 2 AA batteries. It's surprisingly powerful given it's size. Love the fact that is has TTL, manual, and even a multiple flash mode. It has a head that can tile from -7 degrees to 90 degrees and swivel from 0 to 270 degrees. This means you can even face the head backwards to bounce the flash off a nearby wall. In manual mode, the power can be set from 1/1 to 1/128th power in 1/3 stops. The zoom head can be zoomed automatically or set to manual. It can also work as a master or as a slave in a master/slave mode. On top of all this, it can even function as a wireless remote trigger for other Godox flash units. I was looking for a more compact flash to accompany my compact micro four thirds camera, and this unit is ideal for the purpose. It works on both Olympus and Panasonic bodies.